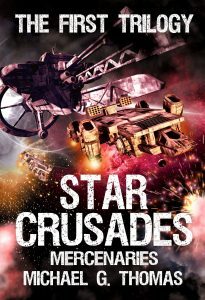 We are just a week away from the release of the 5th and final Star Crusades Mercenaries novel. To celebrate, I’m pleased to announce the release of the first trilogy, that includes the complete text of the novels Lords of War, Ghost Soldiers and Flames of War. There’s never been better time to experience the dark times after the Great Biomech War! Make sure you never miss offers like this and sign up for my newsletter. Star Crusader book 5 is well underway, and this will be a cross-over story that will see characters from the Mercenaries story-line play a part. Ever wondered what would happen if Spartan and Khan appeared in the middle of a battle that Nate is involved in? Well, soon you will! I have two more projects lined up for the Summer. The first of these is the continuation of the Spartan story in a whole new plotline. This will be a fixed length series of five books that I’m sure you’ll love. I also have a collaborative military science fiction story set on Mars that will be worked on with renowned military author, Eric Meyer.